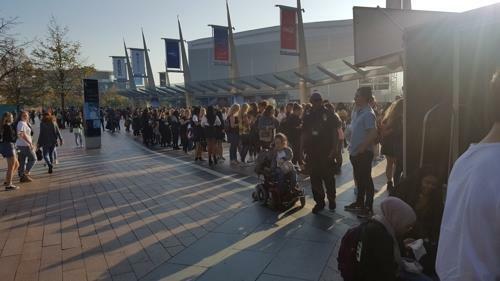 LONDON, Oct. 11 (Yonhap) -- About 20,000 European fans of different skin colors, nationalities and ages enthusiastically sang the Korean-language lyrics of a BTS song when the massively popular K-pop boy band hit London's O2 Area on Wednesday (local time). Many top global stars such as Coldplay, Madonna, Beyonce, Adele and Ed Sheeran have performed there before, but the arena's employees looked surprised at the unprecedented scene of the crowd singing along in unison. They were members of the band's fervent fan club -- known as the Army -- who came to see the group on the European leg of its monthslong world tour. They sang "Spring Day," a song released by the band early this year. The fans who crowded the areas near the concert venue in the afternoon quickly took their seats to enjoy the show as soon as they were allowed in. The seven boys emerged through flames and powerful sounds on stage to begin the second concert of their visit to London. As they opened the show performing "Idol" from their latest release, "Love Yourself: Answer," fans rocked the concert venue, erupting in cheers and chanting zealously. Jungkook had to sit out the group's choreography after hurting his heel hours before the start of the previous show in London. He drew applause for doing his best, performing with facial expressions and hand gestures. His injury caused lots of changes to the dancing, and the other six members also tried their best to fill the blank left by the injured member and gave a powerful performance with their backup dancers. After briefly introducing themselves and greeting their fans, the boys performed other hit numbers such as "Save Me," "I'm Fine," "Euphoria," "DNA" and "Fake Love." When "I Need You" was played, the fans sang along with the band as if it was a duet. The seven-piece group also delivered solo performances. After J-hope took the stage with "Trivia: Just Dance," Jungkook sang "Euphoria" sitting in the center of the stage. Jimin drew loud cheers from the audience by slightly lifting his shirt to show off his abdominal muscles in the middle of performing his solo number "Serendipity." Jin impressed the fans with his piano skills when he did "Epiphany." The show culminated in a finale with the band's mega-hit "MIC Drop." The boys left the stage after a show that last about two hours, but fans remained highly excited. 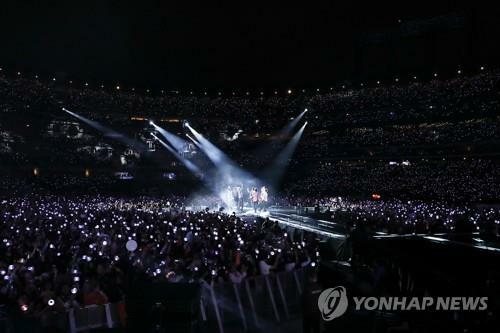 When the crowd begged for an encore, waving noctilucent sticks called "Army Bombs" in their hands, the members turned up again on the stage for a bonus performance. "We're really happy to begin our Europe Tour in London. This is the last song for today, but we'll see you again. Please wait for us," Suga said making a heart shape with his hands at the end of the show. When V said, "London is really good. Streets are beautiful, and Armies, you're really beautiful," the fans responded with thunderous cheers. RM, team leader, took the mike last and said, "I enjoyed the city London and its people very much. I really love you all." 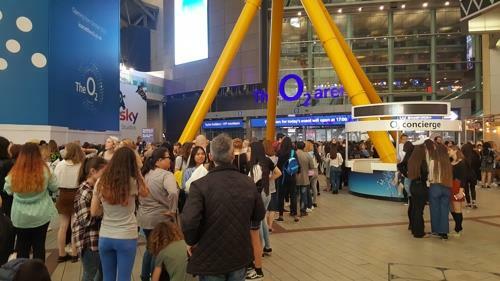 After the show was over, the vicinity of the O2 Arena was crowded with parents coming to pick up their children. They looked pleased to see their kids emerging from the performance venue with happy smiles. After successfully launching the European leg of their world tour, BTS is scheduled to perform in the Netherlands on Oct. 13, Germany on Oct. 16 and 17 and France on Oct. 19 and 20, before flying to Japan.